This name uses Portuguese naming customs. The first or maternal family name is Alves de Castro and the second or paternal family name is Neves. Castroneves at the Indianapolis Motor Speedway for Carb Day for the 2009 Indianapolis 500. Hélio Alves de Castro Neves (Portuguese pronunciation: [ˈɛlju ˈkastɾu ˈnɛvis]; born 10 May 1975), better known as Hélio Castroneves, is a Brazilian auto racing driver competing in the WeatherTech SportsCar Championship. Prior to IMSA, Castroneves competed in the IndyCar Series, gaining 23 wins and 38 poles, and placed second in the season standings four times, third three times, and fourth five times. Castroneves also competed in the CART championship, with a highest championship points finish of fourth; he recorded six wins and seven pole positions in the series. 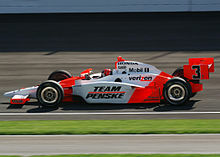 Castroneves won the Indianapolis 500 in 2001, 2002, and 2009, making him one of only nine drivers, and the only active driver, to have won at least three times. He also finished second at Indy in 2003, 2014, and 2017. Castroneves has won four pole positions for the Indy 500, including back-to-back poles in 2009 and 2010, the first driver to do so since Scott Brayton in 1996. He is also one of only five drivers – along with Wilbur Shaw, Mauri Rose, Bill Vukovich, and Al Unser being the other four – and the only active driver to win the Indy 500 in back-to-back races. Born in Ribeirão Preto, São Paulo, Brazil, South America, Castroneves started his career in karting, and later raced for the Paul Stewart Racing team, and finished third in the 1995 British Formula 3 Championship. Castroneves driving for Paul Stewart Racing at Silverstone during the 1995 British Formula 3 season. After being occasionally misidentified by US media as "Hélio Neves" he at first changed the spelling to Hélio Castro-Neves and then to Hélio Castroneves. He has one sister, Katiucia. Castroneves was first recognised while driving for Steve Horne's Tasman Racing team in Indy Lights, as teammate to fellow Brazilian and future IndyCar champion Tony Kanaan. After showing potential but lacking reliability while with the Bettenhausen and Hogan teams, Castroneves was signed by Penske Racing in CART in 2000 following the deaths of Greg Moore and Gonzalo Rodríguez during the last races of the 1999 season. Moore had signed on with Penske but never had the opportunity to race with the team. Castroneves immediately became a regular front-runner winning the Indianapolis 500 in 2001, the first of three wins where he again performed the crowd pleasing act of climbing the fence at the start finish line in celebration, something he would continue to do after winning races. He switched with the team to the rival IRL for 2002, and remained with Penske, teamed with Gil de Ferran, Sam Hornish Jr., and Ryan Briscoe during his tenure through the 2008 season. During the 2002 season, Castroneves tested with Formula One team Toyota Racing at Circuit Paul Ricard. In January 2009, Team Penske temporarily replaced him with Will Power, citing the difficulties of remaining competitive while Castroneves prepared for trial on federal tax evasion charges. Castroneves missed the first race of the 2009 season while the trial was ongoing, but returned to racing at the Long Beach Grand Prix. Racing fans have given Castroneves the nickname "Spider-Man" because of his victory celebration, in which he climbs the trackside debris fence. On 24 May 2009, Castroneves became Indy's 9th (and first foreign-born) three-time winner, by taking the checkered flag for the 93rd running of the Indianapolis 500. Castroneves is widely considered to be the greatest IndyCar driver never to have won the championship. Castroneves currently holds IRL IndyCar Series records for most top-ten finishes (167); Poles (38); and most consecutive seasons with a race win (10; 2001–2010). In 2009 he reset the all-time record for most wins (22) and starts (209) by a driver who has not won the National Championship, taking these records from Bill Holland at Indianapolis and compatriot Raul Boesel at Richmond respectively. His 23rd career win, at Barber Motorsports Park in 2010, broke a tie with his former manager Emerson Fittipaldi for most IndyCar wins by a Brazilian driver. Aside from success in racing, Castroneves won the fifth season of the American reality TV show Dancing with the Stars with partner Julianne Hough. He has also appeared on truTV's The Smoking Gun Presents: World's Dumbest... as a frequent commentator—mainly on episodes that feature the "World's Dumbest Drivers". He currently lives in Ft. Lauderdale. Castroneves returned to Dancing with the Stars for its 15th season for a chance to win another mirrorball trophy. This time he was partnered with Chelsie Hightower. They were voted off in the third week of the competition during a double elimination. Castroneves did not appeared in 2001 film Driven as himself. Castroneves has one daughter with his wife, Adriana Henao. The girl was born on 28 December 2009, and is named Mikaella. Castroneves lives in Fort Lauderdale. On 2 October 2008, Castroneves was charged with conspiracy and six counts of tax evasion by a grand jury for purportedly failing to report to the IRS about $5.5 million in income between 1999 and 2004, according to court documents. Each count carried a maximum five-year prison sentence. His business manager and sister Kati, and his lawyer Alan Miller were charged with assisting Castroneves in the supposed scheme. All three defendants surrendered to authorities in Florida on Friday, 3 October 2008. Castroneves pleaded not guilty to these charges on 3 October, and was ordered released on $10 million bail. Castroneves was replaced by Will Power during the duration of his tax evasion court case. The IRS claimed that Castroneves owed $2.3 million in taxes. A guilty verdict would have likely ended Castroneves' racing career. This issue was related to the initial contract signed by Castroneves with Penske Racing in the fall of 1999. Greg Moore had already signed on to join Penske Racing for 2000, but was killed during the Marlboro 500 at California Speedway on 31 October 1999. During the trial, it was revealed that Castroneves' first contract with Penske (2000–2004) was signed with Moore's existing contract - with Moore's name simply scratched out and Castroneves' name handwritten in ink. The deal was signed by Moore's agent, Alan Miller, who signed Castroneves' deal just days after Moore's funeral as pressure from Penske sponsors forced a quick resolution to filling the vacated seat. Central to the case was the ownership of a Panamanian company called Seven Promotions. Prosecutors called it a shell corporation set up primarily so Castroneves could dodge U.S. income taxes. Hélio Castroneves Sr., Hélio's father, however, testified that he created Seven to boost his son's image in Brazil. Furthermore, Hélio Sr. said his son never owned it. Prosecutors called that a lie, showing jurors numerous documents in which Castroneves claimed Seven as his own. If it was, an IRS agent testified that Castroneves owed U.S. taxes on the full $5 million from Penske even though he had never actually received the money. Instead, the Penske payments were eventually invested in a deferred compensation deal with the Dutch firm Fintage Licensing B.V. Castroneves' attorney Roy Black told jurors in closing arguments that such deals are common – and perfectly legal – for athletes who have relatively short careers and face injury or worse at any moment. The trial ended on 10 April 2009, with closing arguments and the jury deliberated until 17 April, when it acquitted Castroneves of all six counts of tax evasion but hung on a count of conspiracy. About a month later on 22 May, prosecutors dropped the remaining conspiracy charge. 3 The Las Vegas Indy 300 was abandoned after Dan Wheldon died from injuries sustained in a 15-car crash on lap 11. Practicing for the 2007 Indianapolis 500. 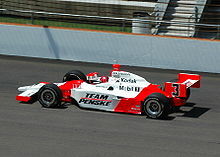 Castroneves' finishes for 2001 to 2003 is currently the best 3 race finishing streak in Indianapolis history. It is equal to the streak posted by Al Unser from 1970 through 1972. ^ ""Foi uma bênção não ir para a F1" - Hélio Castroneves - Na Mureta com Rubito #10". Acelerados (in Portuguese). 18 March 2019. Retrieved 21 March 2019. ^ "Cart's European refugees". BBC News. 20 September 2001. ^ "Castroneves impresses in F1 test". BBC Sport. 21 September 2002. Retrieved 29 July 2014. ^ Graves, Gary (25 May 2009). "Castroneves ascends to new heights at Indy". USA Today. Retrieved 26 May 2009. ^ "Castroneves claims third Indy 500". BBC Sport. 24 May 2009. Retrieved 26 May 2009. ^ "Official Web Page". Archived from the original on 18 May 2011. Retrieved 3 June 2011. ^ Ritti, Missy (29 December 2009). Dancing Star Helio Castroneves Welcomes a Daughter. People, 29 December 2009. Retrieved from http://www.people.com/people/article/0,,20333469,00.html. ^ "PICTURE GALLERY: At Home with Helio Castroneves". Hartford Courant. Archived from the original on 27 May 2014. Retrieved 27 May 2014. ^ "Castroneves indicted on tax evasion – Yahoo News Story". ^ Power replaced Castroneves at Penske during tax evasion case. Retrieved on 13 January 2009. ^ Castroneves owes .3 million in taxes Retrieved on 27 March 2009. Wikimedia Commons has media related to Hélio Castroneves. This page was last edited on 20 April 2019, at 14:44 (UTC).